In March 1917 it was learned by the Revolutionary Party that the pro-Germans had planned a revolution to take place very soon. This revolution was to be used as a pretext to stop the war and make a shameful peace with Germany. The people were discontented, food was scarce, and bread lines were forming. This queue was so long that it was necessary to have police to keep order. 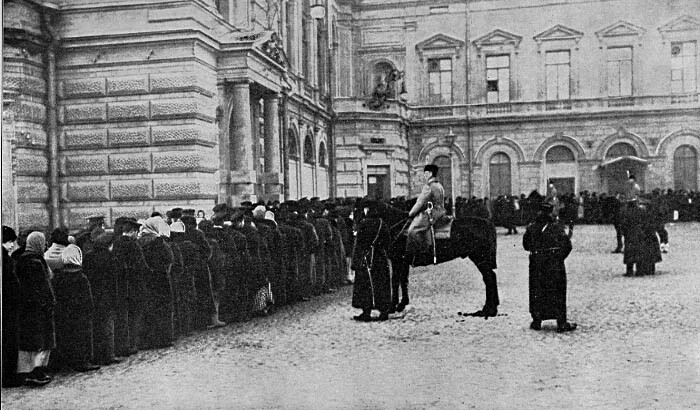 This is one of the few pictures showing the police of the old regime.